Mass Cultural Council is honored to announce the 2012 Artist Fellowship awards in Choreography, Fiction/Creative Nonfiction, and Poetry. Twenty artists will receive fellowships of $7500 and another 17 will receive $500 finalist awards. See a complete list of this year’s fellows and finalists. The awards are anonymously judged, based solely on the artistic quality and creative ability of the work submitted. Applications were open to all eligible Massachusetts artists. A total number of 942 eligible applications were received; 49 in Choreography, 532 in Fiction/Creative Nonfiction, and 361 in Poetry. The Choreography panelists were Deborah Abel, Debra Cash, Jane Forde, and Zach Morris. The Fiction/Creative Nonfiction panelists were Alexander Chee, Pagan Kennedy, Kate O’Sullivan, and Steve Yarbrough. The Poetry panelists were Stephen Burt, Joseph Legaspi, and April Ossmann. Find a full list of 2012 Artist Fellowships awardees, panelists, and readers. 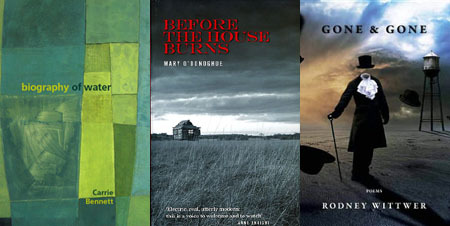 Images: still from SEEKERS, choreography by Alissa Cardone; cover art for books by 2012 Mass Cultural Council Artist Fellows: BIOGRAPHY OF WATER by Carrie Bennett, BEFORE THE HOUSE BURNS by Mary O’Donoghue, GONE & GONE by Rodney Wittwer.